I joined with Cancer Research UK to discuss the impact of cancer on people’s lives and how we can redouble our efforts to find ways to tackle it head on. 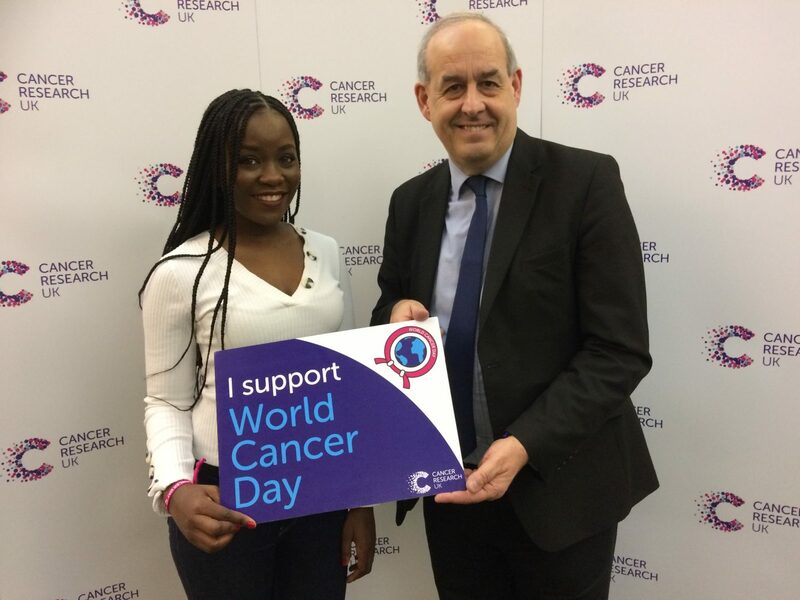 At the event in Parliament, I met with the local Cancer Ambassador for the City of Chester, Chinwe Enyinna, who was able to discuss how cancer impacts on Wales and how MPs can take action. Figures show that 1 in 2 people will get cancer in their lifetime. Rising referrals and a growing population will increase pressure on cancer services. To achieve world-class outcomes for patients, the UK Government must tackle preventable risk factors and address shortages in the cancer workforce. Around 4 in 10 cancer cases in Wales could be prevented. Smoking is the largest preventable cause of cancer in Wales. Overweight and obesity is Wales’s second largest preventable cause of cancer. Obese children are around five times more likely to be obese adults and without proper action this will lead to a growing risk of cancer. David Hanson was told about local statistics for Betsi Cadwaladr University Health Board and discovered that 53.3% of people aged 60-74 take part in bowel cancer screening. This is higher than the Wales average and is something we should build upon. 88.3% of patients in our health board area receive their first definitive cancer treatment within 62 days of an urgent GP referral. This is below the national target of 95% but above the average for Wales. 98.5% of patients in our health board area receive their first cancer treatment within 31 days of a decision to treat. This is above the national average for Wales and above the target set by the Health Minister. The picture is mixed in our area on how well we are performing in treating cancers. I was pleased to hear that we are above the target, and national average for Wales, on the percentage of patients who receive their first treatment within 31 days of a decision to treat. But we need to redouble our efforts to increase the number of people taking the bowel cancer screening tests and the number of people who receive definitive cancer treatment within 62 days of an urgent GP referral. Each and every one of us has had our lives touched by cancer. Be it a diagnosis of cancer for ourselves, a family member or a friend. We can, and must, do better to help those with this horrible disease. Working with organisations, such as Cancer Research UK, is vital to ensure that we get national policies right.